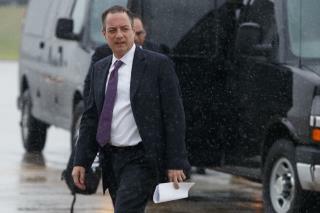 (Newser) – Outgoing White House chief of staff Reince Priebus says that he formally resigned from his job after it became clear the president wanted to go in a different direction, the AP reports. Priebus tells CNN that he resigned on Thursday; President Trump announced the staff shakeup in a tweet Friday. Trump has picked Homeland Security Secretary John Kelly as his new chief of staff. Priebus says he supports the president and that he's "doing great" personally. Priebus says he intends to continue working at the White House for a couple of weeks to ease the transition of his replacement. Priebus calls Kelly a "brilliant pick" and says he himself remains a Trump fan. Republican Party : Hey, Mr. Reince Priebus, you cannot blame anyone but yourself, from the beginning at Iowa, at New Hampshire, supposed Republicans were backing Stanford's 2016 (CEO) CARLY FIORINA for 2016 US President to White House, the Republican Party won't happen to let Trump's Mafia family to hijack the whole Republican Party to run the United States and resulted only under 30% approval rating. trump makes his staff write their resignation letters before they start the job. None of these resignations are amicable, nor are they leaving on good terms. Total BS. Priebus was treated like a door knob while Ivanka, Kushner, Bannon, all walked past him without so much as a nod to Priebus who they all perceived as lower class. Priebus was the only connect to Congress and during the long health care debacle he was frequently in the halls of Congress to understand what was happening so he could take it back to the White House meetings. There were no meetings. Trump did not care about health care. Ivanka and Kushner continued to behave as Prince and Princeling. Bannon continued to slither around. The White House is in ongoing bedlam because Trump has no idea what he is doing. John Kelly is an honorable man who can help Trump stabilize this train wreck. But more and more we see that is what he really likes.